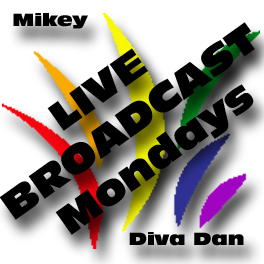 Last night’s show we featured Heather Anne Burton, Medium Psychic on the Diva Dan and Mikey Show. What an interesting hour it was. I will admit, I have received some email feedback that has been negative but more positive email than anything. But I would like to reflect on the night and some inner thoughts here. Firstly, I am impressed by Heather Anne more than anything. It must be difficult to be granted a gift or to have connection like she says. The learning curve she must have went through where there are no books written for a young child to figure out what is going on must be a journey. You definitely need an open mind talking to her. Off camera, she is just as amazing. This woman knows her history and is really fascinating to chat with. She doesn’t dismiss God or claim that she knows better than God. I found that to be fascinating. I assumed, that someone like her doesn’t have any association with God. An assumption that is clearly wrong. Diva Dan is spiritual minded but not in the traditional sense of what organized religion preaches us to be. Many people thought Diva Dan was bored during the conversation, but that was completely the opposite. Daniel was looking at the monitor below the camera to watch for Conversation that could be used with the broadcast. I thought he did a remarkable job of bringing the viewers more into the conversation. It’s probably something I would have never done. I knew that bringing Heather Anne onto the show would be a thinker for many people. Bring your drinks and open mind. As you could tell in a few parts, I wasn’t buying into some of it and asking questions. BEFORE YOU JUMP ON ME FOR THAT… I’ve never known anyone like her so I found it fabulous to finally ask her some burning questions. Diva Dan noticed Heather Anne was looking past him or behind him as she spoke. Diva Dan is convinced she was seeing things pertaining to him that was never given out. So if you never believed a word you heard last night… DID YOU NOTICE HALF WAY THROUGH THE SHOW how many people reached out to ONIX and LAURIE. So if you think Heather Anne was being fake, how could you deny what happened on the show? If anything, her presence got two people to reach out and the rest of us to embrace these people that needed re-affirmation. If anything I was overwhelmed by how these two people were covered in love during admissions to what is happening in their lives. THATS EXACTLY WHAT I WANT FOR MIKEYSSMAIL… FOR PEOPLE TO REACH BEYOND THEIR OWN LIVES AND TOUCH ANOTHER… WORDS ARE CHEAP BUT PRICELESS WHEN USED PROPERLY. I’ve never had anyone I care about die, so I don’t have a reason to look into the spiritual world for someone who was here with me in the present. However, I believe I have a spirit guide helping me. However, you can’t expect, you need to ask and when the time is right for you, it will manifest itself if you are meant to have it. I will admit I struggle with organized religion. In the majority of Religions, there is no place for me. My lifestyle makes those religions exclusive. Some will name certain denominations as being accepting; however, that doesn’t mean that the people follow that to a tee. Remembering that someone recently didn’t want their picture taken by my camera as they wanted no association with my lifestyle or it being recorded anywhere… YES, from a denomination that is accepting. I find many organized religions are preaching how I can change to meet their expectations. I just wonder if anyone has thought, maybe my presence here is to challenge them in their beliefs… I know people in person who would find it a personal triumph if I switched back to straight lifestyle. I see it as a notch on their religious pole if I did that. However, instead of spending so much time and effort trying to get me to switch, what about their own belief system… are they following it or cherry picking. I find it best to stay away from people who are trying to get me to stop being me… instead embrace the difference and adapt… even if adapting means ignoring me if they are unable to cope. What I find interesting is that one email targetted me this morning as being immoral and how dare I question God and bring Heather Anne Burton on my show. They went on to tell me that GOD IS GOD and that I need to repent, change, and beg forgiveness… as it stands right now, I am going to hell in a hand basket. It must be nice to be so sure that the view of this person is the only way of life. I guess the rest of the world and the mult-cultural diversity of this planet is wrong in their belief systems. Myself, I don’t know the answers… but I am open minded enough to question it but not dimish others for their own beliefs. Organized religion is dying off and I think many people are like me… unsure and having more questions than answers. It’s easier to stay away than belong and follow something you are just not sure in. Many people might call that faith in believing… but I would prefer to stay away and see people as human beings and not the title of their faith system. If that makes me anti-religious than sobeit, but you will never find me posting a sign telling others to do something with their lives. That’s not my place… my place is to make my life meaningful and enrich other people with creativity instead. Life is too short to be someone your not. This entry was posted in Announcements and tagged Dan, Diva Dan, follow, Heather Anne, Heather Anne Burton, Mikey, TheCrochetCrowd. Bookmark the permalink.